CHICAGO, IL—Sep 18, 2018—LoadDelivered, a leading food and beverage specialized third-party logistics (3PL) firm headquartered in Chicago, spent National Truck Driver Appreciation Week honoring and celebrating the 3.5 million professional truck drivers in the United States. National Truck Driver Appreciation Week, celebrated this year from September 9-15, is an annual weeklong event which formally recognizes professional truck drivers. According to the American Trucking Association, “more than 80 percent of U.S. communities rely exclusively on truck drivers to deliver their goods and commodities, including the most remote towns and territories that are unreachable by other modes of transportation” (ATA). These dedicated professionals will often drive overnight, on holidays and weekends, through bad weather conditions to ensure the goods people consume every day are being delivered safely and on-time (Indeed). 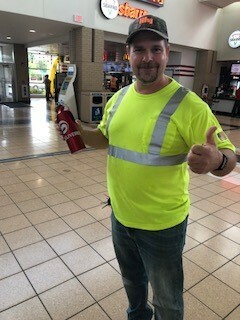 To show their appreciation for their valued carrier partners and all professional truck drivers last week, LoadDelivered ran a “Driver of the Day” social media campaign and visited local truck stops throughout the Chicagoland area. On Monday and Tuesday of last week, members of the LoadDelivered team traveled to truck stops in the Chicagoland area. While there, they met with trucker drivers to hand out water bottles and gift cards, discuss the hardships of the job, and remind them of how vital a role carriers play in the larger supply chain arena. 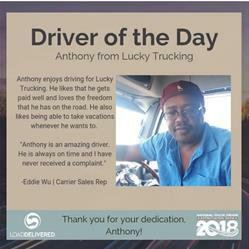 In addition to the local truck stop visits, LoadDelivered ran a social media campaign throughout National Truck Driver Appreciation Week honoring a “Driver of the Day” that has gone above and beyond for their carrier representative and customer’s needs. New legislation in the retail and transportation industries, like the Hours of Service laws and On-Time-In-Full requirements, have made it increasingly difficult for professional truck drivers to fulfill all of a load’s requirements. LoadDelivered is committed to working with their carrier partner’s preferences’ and Hours of Service clocks to ensure that drivers’ time is optimized, and shipper expectations are still met. Food Logistics selected LoadDelivered Logistics as a 2018 Top 3PL & Cold Storage provider in August. Without great carriers, LoadDelivered would be unable to achieve such an honor. LoadDelivered was recently acquired by Capstone Logistics, a leading provider of outsourced supply chain solutions to distribution centers in the grocery, foodservice, retail, and other industries. The partnership supported strategic growth for both companies and scaled business to the next level. National Truck Driver Appreciation Week was established by the American Trucking Associations to celebrate the 3.5 million truck drivers who move freight for all types of companies every day. Many truck stops, carrier companies, and other logistics companies participate in gifting and thanking carriers across the US.